Hollywood's "Gentle Giant" shocked the world in 1985—and this shock would continue to make waves well after his death. Silver Screen Collection/Getty ImagesRock Hudson and Doris Day circa 1960. What was intended to be an innocuous plug for an upcoming TV show ignited a national conversation about HIV/AIDS. 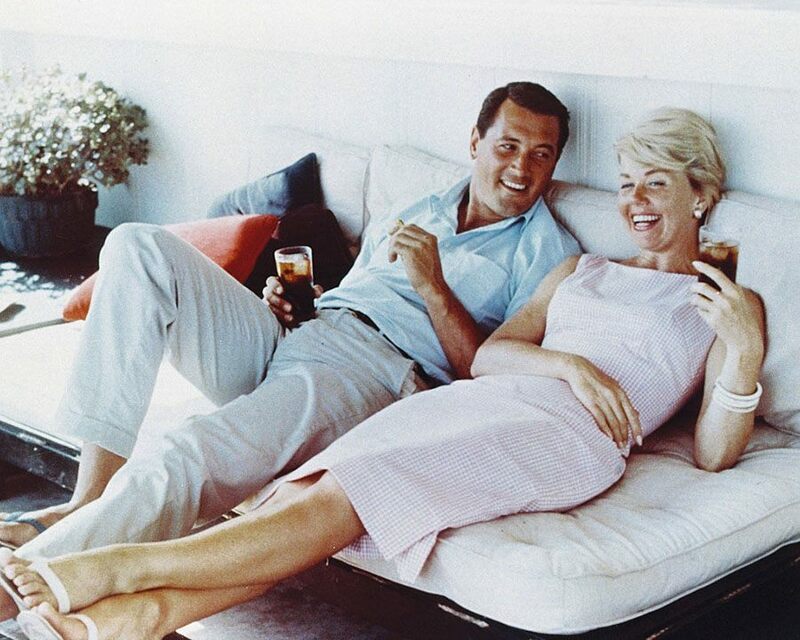 In July of 1985, popular actor Rock Hudson traveled to Carmel, Ca., for a public appearance alongside longtime acting partner, Doris Day. Day, an animal rights activist who starred in films such as “Pillow Talk” and “Send Me No Flowers,” had decided to return to the screen via “Doris Day’s Best Friends,” a Christian Broadcasting Network-sponsored show that centered on animals. But when Hudson, who often played Day’s love interest in films, stepped out to greet the audience, a nation gasped. That day, reporters did not see Rock Hudson, the man whose buff physical appearance had led many to associate him with a quintessentially American brand of masculinity over the course of his career. Rather, they saw his ghost: rail thin and quivering, sarcomas scarred his body. Speculation came quickly: Was it liver cancer? That was, at the very least, what publicist Dale Olson said shortly after Hudson collapsed while on a subsequent trip to Paris that month. Of course, it was only a matter of time before Americans — and more generally, the world — learned what stood at the root of Hudson’s spectral appearance: HIV/AIDS. Indeed, the actor — who, like many homosexual men, concealed his sexual orientation from audiences for the duration of his career — had been diagnosed with HIV/AIDS just a year earlier in June of 1984. Three months after his final appearance with Day, Hudson succumbed to the illness. He was 59 years old. 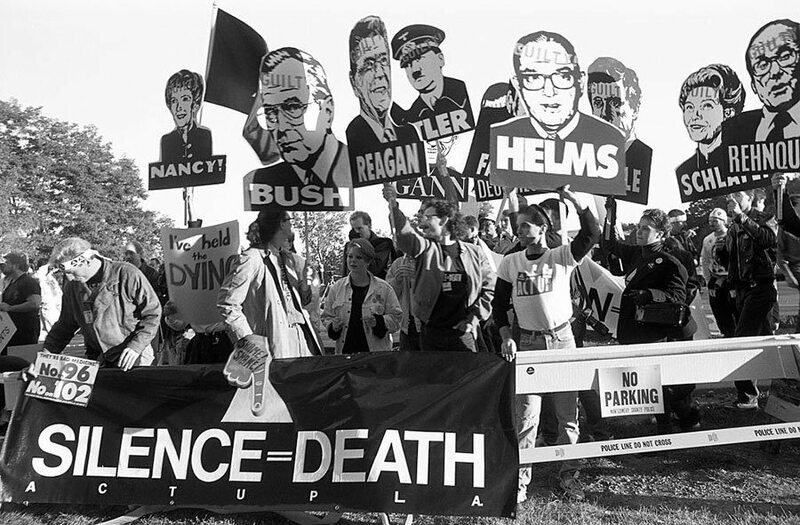 Catherine McGann/Getty ImagesMembers of AIDS activist group ACT UP (AIDS Coalition to Unleash Power) hold up signs of George W. Bush, Ronald Reagan, Nancy Reagan, Jesse Helms, and others with the word “Guilty” stamped on their foreheads, along with a banner stating “Silence Equals Death” at a protest at the headquarters of the Food and Drug Administration (FDA) on October 11, 1988 in Rockville, Maryland. Advances in medicine over the past several decades mean that these days, an HIV/AIDS diagnosis does not necessarily spell imminent death. Likewise, as researchers and the public have learned more about the disease — namely that it cannot be contracted solely by “bad” or “deviant” behavior — HIV/AIDS has lost much of the social stigma it carried in the height of the 1980s epidemic. In light of these changes, Hudson’s public appearance in 1985 was all the more momentous. By that year, HIV/AIDS had already killed thousands of people, and medical researchers knew remarkably little about it or how it spread. This lack of knowledge, coupled with its then sure-fire death sentence, made the nature of HIV/AIDS — and the nature of the person who had it — subject to wild, often homophobic speculation. There was some factual basis for focusing on the gay community when attempting to understand the disease, at least initially. When researchers first identified the disease in 1981, it presented among clusters of homosexual men in Los Angeles and New York City. It was this early association between homosexual populations and the disease that led researchers — and more broadly, the public — to believe that the disease could only be found in homosexual men. As Gregory Herek and John Capitiano note, early media reports thus referred to the disease as “gay cancer” and “gay plague,” with some health service professionals going so far as to deem it “Gay-related immune deficiency” or GRID. That there was a general lack of leadership from the Oval Office did not help matters. Indeed, it was not until May of 1987 that then-President Ronald Reagan gave a major public speech on the epidemic — and even then, reports suggest that the speech only came after actress Elizabeth Taylor, a friend of Hudson’s, requested that Reagan acknowledge the issue. Most accounts suggest that it was, in general, an uphill battle to get the Administration to move on the unfolding crisis. Two years prior to his seminal speech on the matter, the Reagan administration — generally disinclined to a centralized response to the crisis — recommended cutting federal spending on AIDS by $10 million, which journalist Hank Plante notes made the city of San Francisco’s budget for HIV/AIDS larger than the HIV/AIDS budget for the entire country. 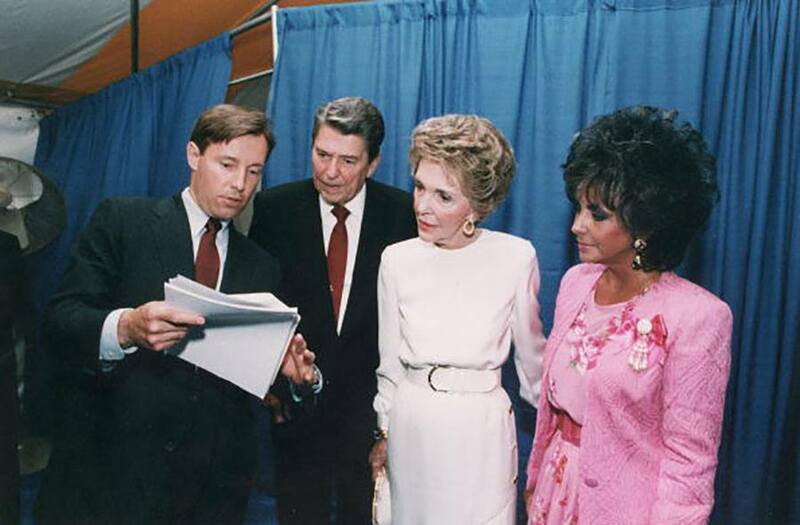 Ronald Reagan Library/Getty ImagesUS President Ronald Reagan and First Lady Nancy Reagan look at notes held by an unidentified aide, as they stand backstage with American actor Elizabeth Taylor at an AIDS research speech, Washington, DC. 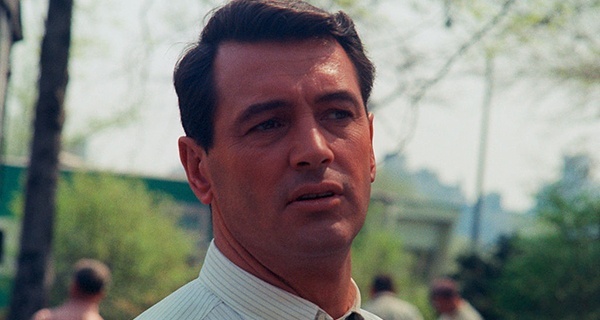 But when Rock Hudson succumbed to the disease, many firsthand accounts noted that attitudes and attention devoted to the topic changed — and on multiple levels. On the one hand, Hudson became the first celebrity, and thus the first public face, of the mortal cost of HIV/AIDS. For better or worse, that one of Hollywood’s “golden children” could die from HIV/AIDS — which, again, at this point was still associated with “bad behavior” — pushed the epidemic to TV screens and magazines across the country. Indeed, the toll of HIV/AIDS could no longer be ignored by those not immediately impacted by it. To those living with the disease, Hudson’s courage altered the way that they perceived their own circumstances, and what to do about it. That’s not to say that Hudson sparked uniform agreement on how best to respond to the epidemic, either in Hollywood or on Capitol Hill, however. In 1987, when Hudson’s death and other mounting fatalities rendered HIV/AIDS unignorable, Congressional conservatives still attempted to inject their own morality into governing the emergency. Indeed, North Carolina Senator Jesse Helms would propose legislation that barred the use of federal funds for AIDS prevention and education campaigns that “[promoted] or [encouraged], directly or indirectly, homosexual activities” and permitted their use solely for campaigns that would address “a large number of people from all backgrounds—male, female, homosexual or heterosexual,” Smithsonian wrote. No matter the initial hysteria, though, those living at the time say that Hudson’s death sparked a sea change in attitudes toward HIV/AIDS — and one that would outlast reactionary panic and an administration that had to be consistently pressed to do anything to address the crisis. After reading about how Rock Hudson’s AIDS changed how America’s approach to the virus, read about David Kirby, the HIV/AIDS-stricken man whose photo helped spark national dialogues over the 1980s AIDS epidemic.